Last month I started what I hoped would become a new series of feature reviews spotlighting soundtrack albums. As you may know, I have long been a fan and collector of film scores, but have never directly reviewed them before until now. But with this being such a busy time of year I haven't been able to review them as often as I would like. The fact of the matter is, that no matter how much I love film scores, I don't have the musical knowledge that many other excellent soundtrack reviewers such as Christian Clemmensen and Jon Broxton do. Film is my medium and I can discuss it backwards and forwards, but I just don't know the musical terminology to really discuss it as in depth as I would like. Still, I would like to indulge my passion for film scores here at From the Front Row, and have devised what I think is a better method for me to review upcoming scores. So I am proud to introduce The Cue Sheet, a new feature that will spotlight notable upcoming soundtrack releases. I hope these are as helpful for you as they are fun for me. 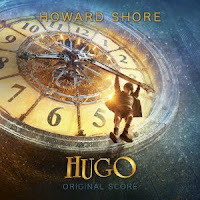 Hugo marks something of a departure for both director Martin Scorsese and its composer, Howard Shore. Neither have been known for their light fantasy work for kids, with Scorsese being most famous for his gangster films such Goodfellas, Casino, and The Departed, and Shore for his horror work for David Cronenberg as well as his Oscar winning Lord of the Rings scores. The result of this unusual pairing of composer and material, however, is nothing short of magical. It is a light score, to be sure, but one that remains recognizably Shore's work, going off in new directions while maintaining his unique compositional personality. Shore introduces his main theme quickly in the opening cue, "The Thief," a wondrous and decidedly French sounding melody that is reminiscent of Michael Giacchino's work on Ratatouille. Shore very distinctly conjures images of 1930s Paris to compliment the film's setting through liberal use of jaunty accordions, which are put to work with some of Shore's recognizable staggered rhythms in "The Chase." While most of the score remains light and breezy, Shore conjures a sense of childlike wonder and grandeur in cues like "The Movies" and "The Message," which are clearly meant to invoke the magic of the movies, which is a key theme in the film. Similarly, in "The Invention of Dreams," Shore conjures up such a frenzied evocation of sheer joy and wonderment that it's hard not to be swept away by its buoyant optimism. In fact the entire score sends the listener off on a cloud. It's an easy but rewarding listen, a lovely score with a light comedic touch that adds a new and successful dimension to the composer's career. Alberto Iglesias is already having a strong year, coming off his haunting work for Pedro Almodovar's The Skin I Live In. His latest work in Tomas Alfredson's Tinker Tailor Solder Spy goes in a completely different direction from his more classically minded ideas in The Skin I Live In, but it's no less effective, and perhaps even stronger in its construction. It is, if nothing else, a more consistent listen than Skin, which tended to switch modes quite quickly, whereas here Iglesias is working toward a very specific mood. There is something decidedly old fashioned about his work here, evoking the jazzy scores of film film noir and the spy thrillers of the 1970s. A mournful saxophone greets us in the opening track, "George Smiley," setting the tone for the dark, often lonely score to come. The sax solos, especially when accompanied by solo piano, are the film's strongest feature, creating a certain mood and sense of time and place. Iglesias incorporates more electronic sounding elements in tracks such as "Anything Else," and has some moments of genuine emotional pathos in tracks like "Tarr and Irina," which borders on deeply restrained tragedy. However, as can be expected with scores for films such as these, much of the album delves into atmospheric rambling. 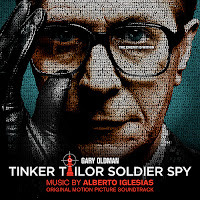 Iglesias incorporates some of the dissonance heard in his Oscar nominated score for The Constant Gardener and turns it into a rumbling underscore that, while effective, is a bit of a rambling listening experience on album. There are some definite highlights however, in the aforementioned tracks and in the final suite, "Tinker Tailor Soldier Spy," which recaps the score's main ideas. Casual fans of the score may be best served by downloading that final track. It's a fine score, but as a CD experience without context it tends to get lost in the background. 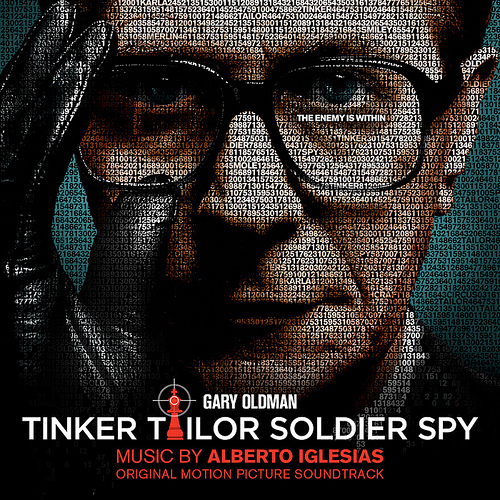 TINKER TAILOR SOLDIER SPY will be available on CD November 21. There are few events that cause more excitement in me than the release of a new John Williams score. A lifelong fan of the maestro's work, I have eagerly awaited each new release for years. Williams is my favorite composer, and I hold even his lesser scores in very high regard. The once prolific 79 year old composer's output has declined significantly in the last decade. 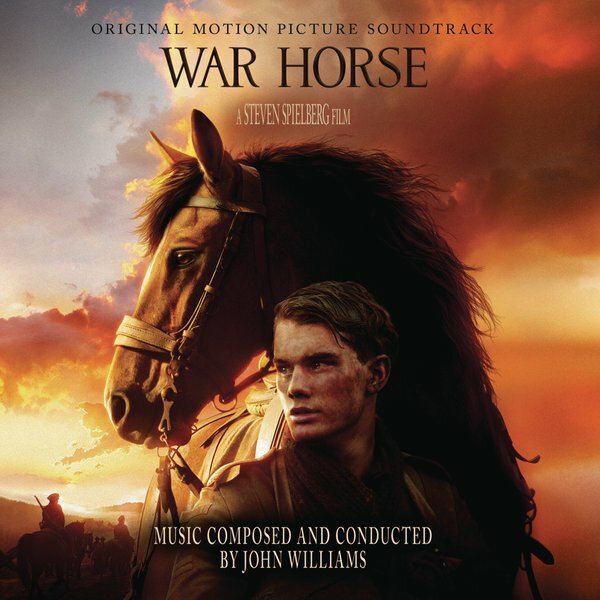 Whereas once upon a time Williams had at least one new score a year, only taking a break once every four years, War Horse marks the first Williams score since 2008's Indiana Jones and the Kingdom of the Crystal Skull, which itself was his first effort since 2005, which saw the composer write music for 4 different films, Star Wars Episode III: Revenge of the Sith, War of the Worlds, Memoirs of a Geisha, and Munich. I stand by Munich as perhaps Williams' masterpiece of the decade, but we have reached a point in his career where each new score is more of a cause for celebration than ever. And Williams has delivered on every level. War Horse is a grand return for the composer, recalling some of his sweeping epic works of yesteryear. While Williams is perhaps best known for his blockbuster scores to films like Star Wars, Jaws, Indiana Jones, and Superman, it is the dramatic Williams of Schindler's List, Angela's Ashes, and Munich that I have always appreciated the most, and War Horse is Williams in full on dramatic mode. The composer wastes no time in introducing his main theme in the opening cue, "Dartmoor, 1912," which recalls his work on Ron Howard's Far and Away. As its title suggests, the theme conjures images of galloping horses and the sheer freedom of horseback riding, building to a grand crescendo as only Williams can do them. The secondary theme, which appears in the film's trailer, is first introduced in "Bringing Joey Home, and Bonding," and is, I think, an even more stand-out thematic idea than the main theme, but Williams uses it far less, probably reserving it for very specific moments in the film. It's a noble, almost militaristic theme for brass that would have been right at home in Saving Private Ryan, and mostly likely represents the WWI side of the story. Williams gives the main theme its most grand workouts in "Seeding, and Horse vs. Car," and most especially in "Plowing," which gives us our first full on statement of the secondary theme, and it really is a goosebump raising moment in classic Williams fashion. After that the score turns dark, with the heavy and militaristic cue, "The Charge and Capture," which builds to a payoff that we never receive. "The Desertion" continues the darker mode with more tense battle music, but none of these action cues ever last for long, even in the climactic "No Man's Land," wherein Williams actually sounds as if hes emulating Hans Zimmer's Pirates of the Caribbean scores. The real meat of the score is in the last two tracks, "Remembering Emilie, and Finale" and "The Homecoming." Together they make up a truly breathtaking 13 minutes of music that are probably the best moments of film music this year. The solo piano in "Remembering Emilie" is especially heartbreaking, as Williams closes out the score on a reflective yet optimistic note, before launching into an 8 minute recap of the film's major thematic ideas. 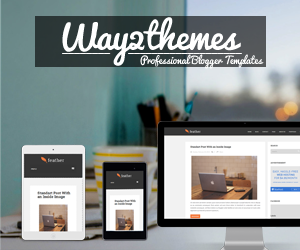 Surprisingly, neither the main theme or the secondary theme receive full-on suites the way Williams often does in his scores, and its a shame because the secondary theme seems almost underused and begging for a fully fleshed out performance. Longtime fans of Williams will find lots of recognizable moments here, as he recalls pieces from scores like Harry Potter and Star Wars Episode I, but on the whole it's another brilliant work from a true master. It feels a bit like Williams on autopilot, certainly, and feels a bit anonymous in the middle stretch, but Williams' autopilot is better than most composers' best work. The last two tracks are worth the price of the album alone. I've missed the experience of sitting down with a new John Williams album greatly, and War Horse satisfied my hunger. It's a grand and gorgeous score that recalls some of his earlier triumphs, proving that Williams can still move an audience like no other. Welcome back, Maestro. We missed you. 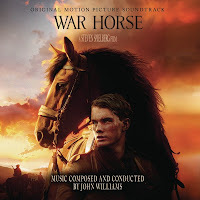 WAR HORSE will be available on CD and digital download November 21.